The bond between brother and sister is like no other. Sure, you grew up probably pulling hair and kicking shins, but you then experienced those precious family moments that you could have experienced with anyone else. In this bond there is trust, loyalty, and probably a lot of inside jokes. So, why not commemorate this bond with a tattoo? Here are some favorites! 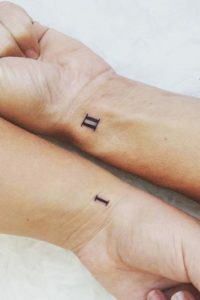 These simple tattoos could stand for a lot, but in this case they stand for first born and second born. 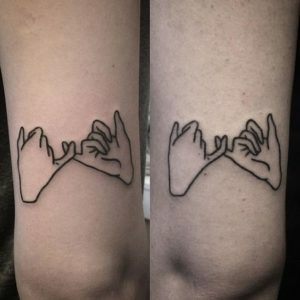 These simple tattoos are a reminder that you are not alone. And, it does so in a way that is not overbearing or over-explanatory. This is for the brother-sister duo that has always been each other’s saviors. 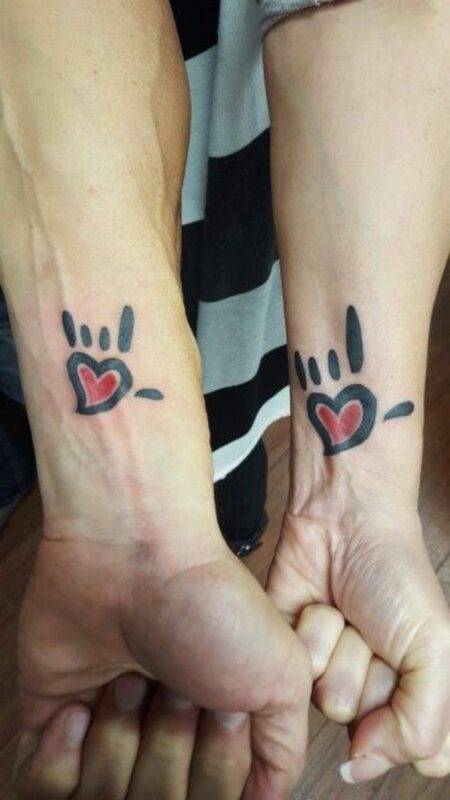 This is definitely for the pair that would bail each other out of jail without telling their parents. If your brother is the first one you call when you are in trouble, these are definitely the tattoos for you. There is a definite strength in bucking up and saying, “we got this” even when times seem the hardest. 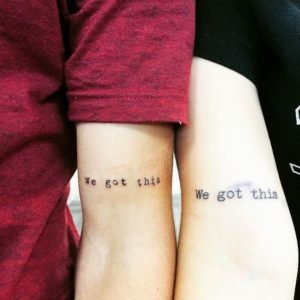 If you and your brother have been through hard times, but always seem to work together to get through it, then these beautiful, yet, simple words are what you should ink on your skin. 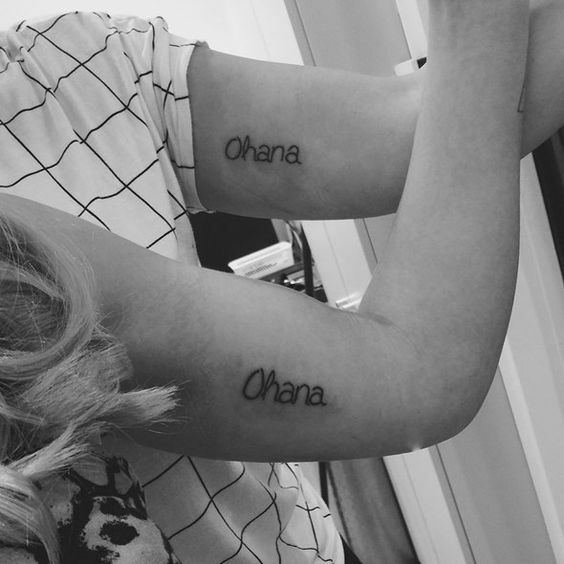 Ohana means family. And, if the idea and traditions surrounding family are what make your bond with your brother so strong, then definitely consider this word as an option for a tattoo. This tattoo gets bonus points if you are connected to the Hawaiian culture in any way. 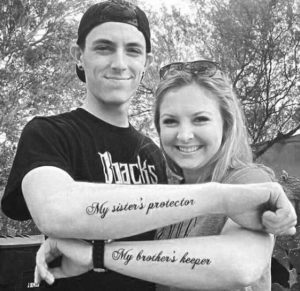 Sadly, sometimes, brothers and sisters are left with just each other. And, even though it seems grim, the hard times will only prove how strong your bond really is with one another. 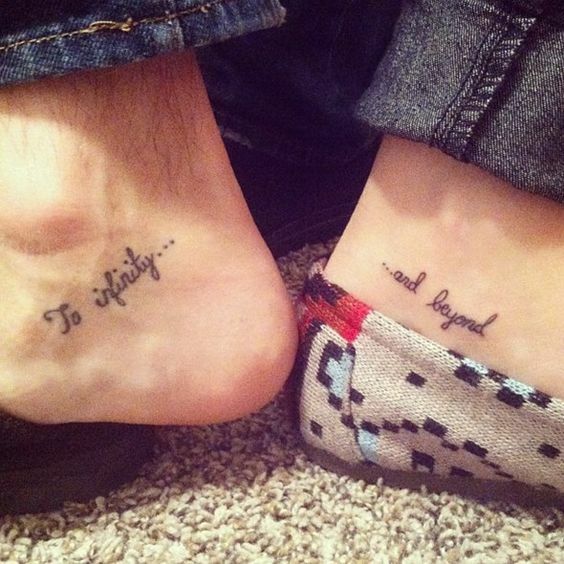 This tattoo is a reminder that no matter what you have each other and that is enough. These tattoo designs are for the brother sister duo that have different hobbies, but are both equally passionate about them. 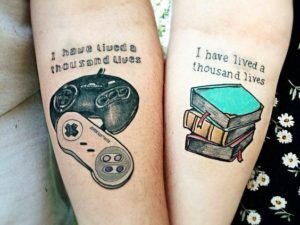 Stories come in many shapes and forms and if you and your sibling appreciate them equally, maybe a design dedicated to those hobbies would be appropriate. 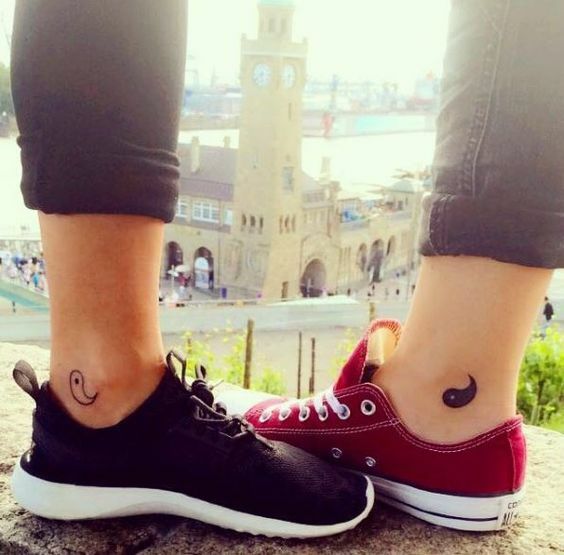 The sun and moon tattoo are a symbolic pair. The sun represents good times and brightness, while the moon represents the darkness we experience. 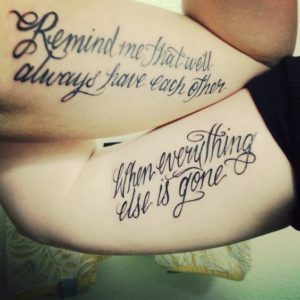 If you and your brother are together through both good times and bad, then this is a tattoo pair you should consider. Pinky promise tattoos for a brother and a sister are good for two reasons. One, it gives an image of childhood and secrets from mom and dad. 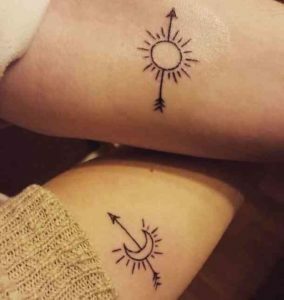 And, two, it represents that bond of loyalty going from childhood into adulthood and expanding and nurturing your familial bond. If your brother is like your other half, then you may want to get this puzzle piece tattoo. Maybe, you weren’t born twins, but he definitely could still be another part of you! 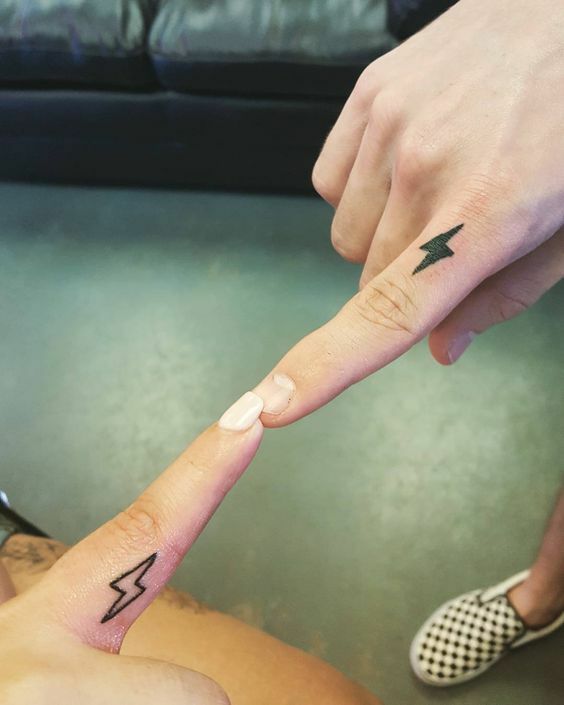 These cute little lightning bolts are perfect for those electric eccentric brother sister relationships! They are also ideal if you are a Harry Potter loving family. They don’t take up much space and they are silly and sophisticated all in one! 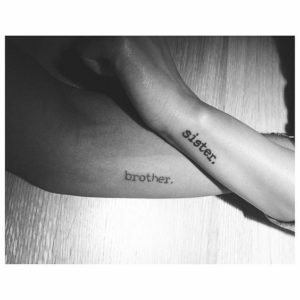 If one of the words you use to define yourself is ‘sister’ then you should consider this simple tattoo design. The words we use to define ourselves is important, because it shows what we consider ourselves the most and what we are proud of. This cute heart lines stating ‘big brother’ and ‘little sister’ are a beautiful tribute to the brother and sister who can’t live without each other. The heart line represents life and being alive and by adding the script to the design, it symbolizes their need for their other half. 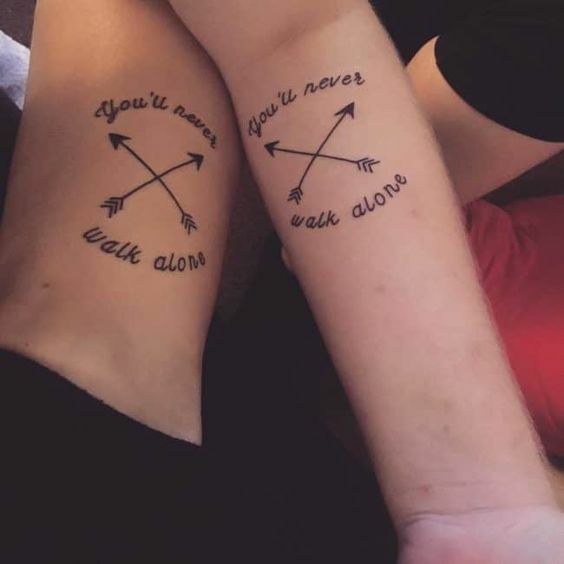 This tattoo design is a great reminder that when you have your brother in your life, no matter how far he is from you, that you will never walk alone. A strong relationship between siblings can handle distance gracefully. And, it will never feel as if they are not there for you when you need them the most. 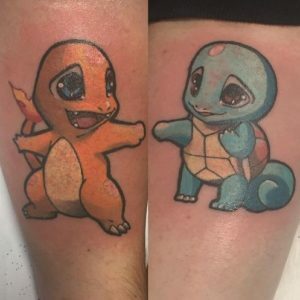 This tattoo design is for the brother and sister who grew up watching Pokemon! It’s fun and silly, and it’s a total throwback to childhood and something that brought you close together during those years of tattle-taling, arguing, and beating each other up. 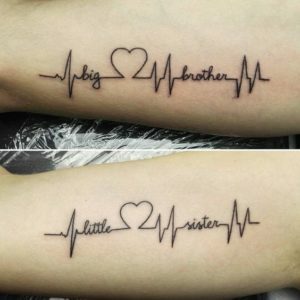 These beautiful designs are for the sibling bond that is extremely natural. Deer represent beauty in nature. So, if your bond with your brother has always been easy and beautiful, or if you both happen to bond over nature, then you should definitely consider this design or something equally natural and artistic. Lisa and Bart Simpson are one of the most famous brother and sister goals. 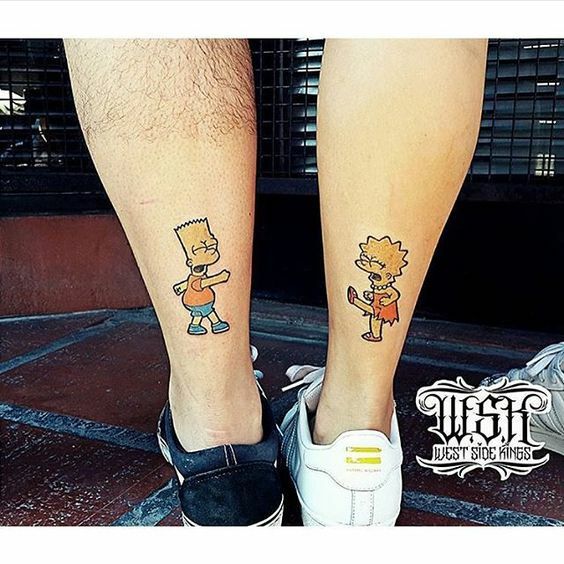 If you and your brother are big Simpsons fans, or if you happen to represent this iconic duo, then you should definitely consider this comical tattoo pair. These adorable little initial tattoos are the perfect way to commemorate your brother sister relationship. 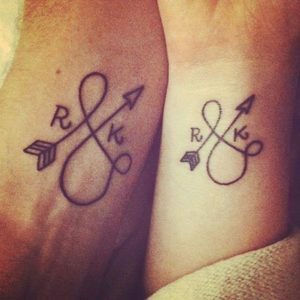 With one initial representing your name and the other representing his entangled in an arrow, it will always remind you which way is home. 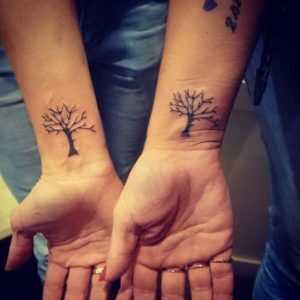 Family tree tattoos are a great way to symbolize bonds with your family. Trees have roots that run deep, which will remind you how strong your bond with your brother is. This tattoo is a favorite for Toy Story lovers and Disney lovers in general. The famous Buzz Lightyear’s, “To infinity and beyond” quote will remind you that there is nothing that your brother and you would not do for each other. This is for that Disney-loving brother and sister that we all know. 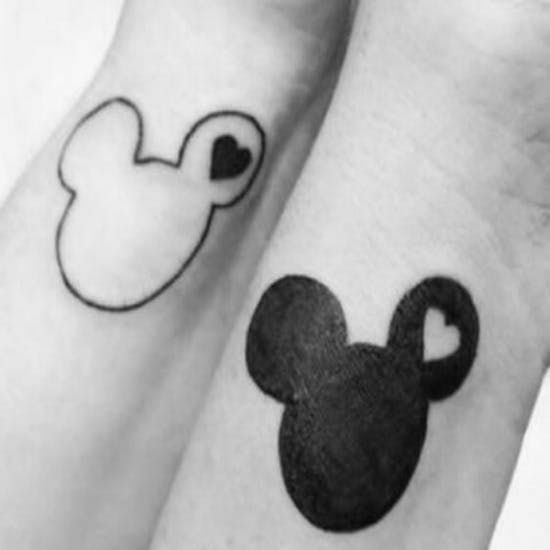 Minnie and Mickey are the originals, so if you and your brother consider yourselves just that, then you should definitely get these designs inked on your skin! There is always that brother and sister who get into more trouble together than they do separately; from stealing cookies from the cookie jar to crashing mom’s car. 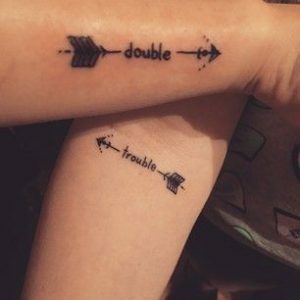 And, if this dynamic describes you and your brother, then definitely consider getting this ‘double trouble’ arrow design. 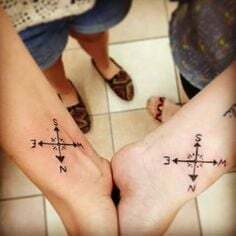 The compass design is a classic tattoo for people who have strong relationships with each other because it represents that they are there for each other no matter where they are globally. 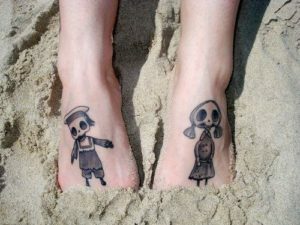 It is also a great tattoo design choice for a brother and sister who like to travel a lot and together. So, if your brother is your ultimate travel buddy, then look no further, this one is for you! 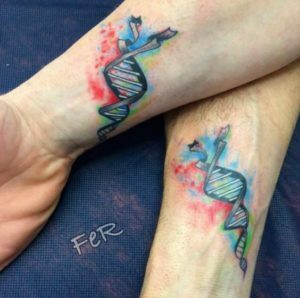 These nerdy DNA strand tattoos are perfect for the brother sister duo who love science. They are a great reminder that you come from the same genes and you will always be connected in this way. 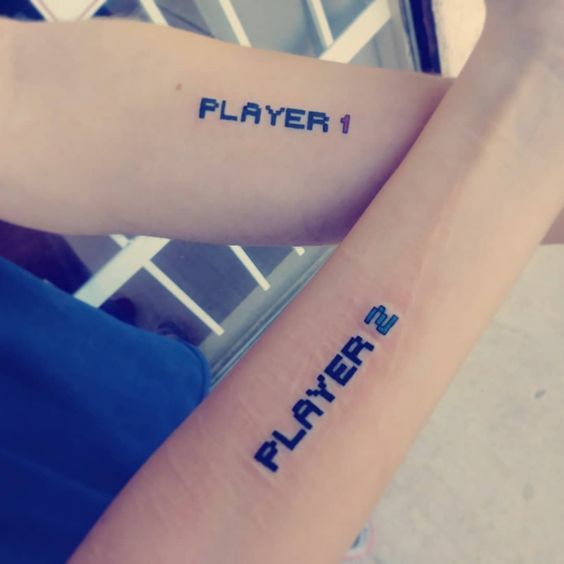 These ‘Player 1’ and ‘Player 2’ tattoos are for the gaming brother and sister who tend to spend their time in front of the screen with a controller in their hands. It is a way to recognize a childhood bond. 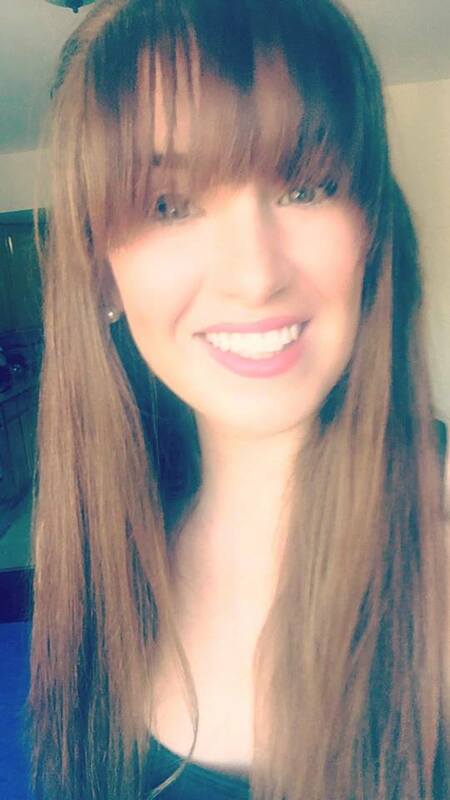 And, they’re also pretty unique and cute, in a kind of nerdy way. These organ tattoos are a little creepy, but they are also super unique and raw. If you and your brother have a raw and unique relationship, then these organ tattoos might be the choice for you. 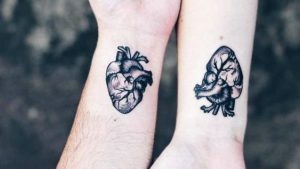 You could pick to ink a brain or a heart on your skin depending on the nature of your relationship. These cute year of birth tattoos are a great way to celebrate you and your brother’s bond. 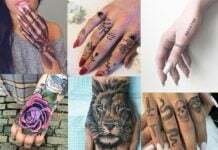 They take up very little space and the simplicity of these tattoos are perfect for some that are a little tattoo-shy. 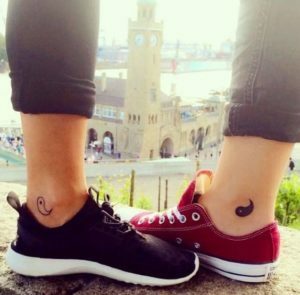 These ying and yang tattoos are a spiritual way to commemorate the special relationship between you and your brother. 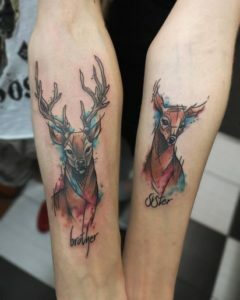 If you and your brother seem to balance each other out, then this is the right choice for a tattoo design. Also, they are super cute and classy and fit together like a frienship necklace would! 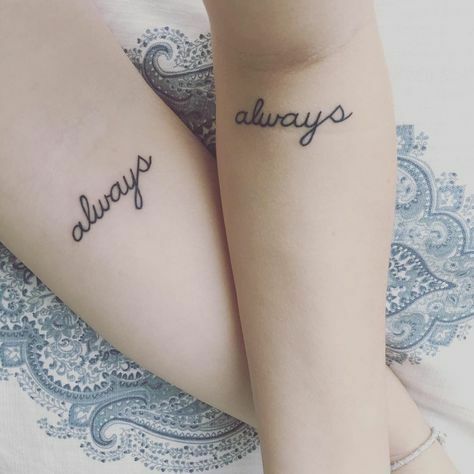 The word ‘always’ means so much. 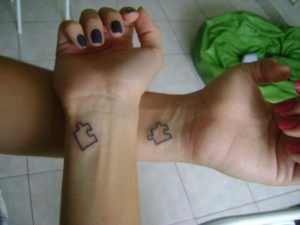 It means that you will always be there for each other. You will always remember each other. You will always fight for one another. You will always be connected to each other. And, no matter what you will always love each other. What more would you want a brother sister tattoo to say? 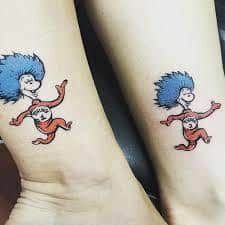 These Thing 1 and Thing 2 tattoos are perfect for the brother and sister who grew up on Dr.Seuss. They are also great for the brother and sister who maybe seemed to get in trouble a little too much with Mom and Dad. Check out these creepy and cool Tim Burton character tattoos. 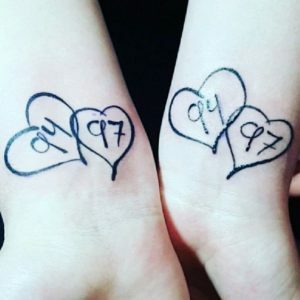 If you and your brother would rewatch Burton classics over and over, then definitely consider getting this tattoo to commemorate that special bond.